Just a couple weeks ago I got to watch my favorite basketball team, the Miami Heat, win their 2nd straight title. They did so on a Thursday and on the next Monday morning, had a full parade going on. How did they prepare so fast for that? It’s an interesting thing to think about what goes into preparing for the NBA Finals. During game 6, the heat were down by 5 with 28 seconds left in the game. Fans were leaving the arena and the Larry O’Brien trophy was on it’s way out, to be awarded to the Spurs. The Heat made some amazing shots to tie the game and ended up winning in overtime to force a game 7. They won game 7 and became repeat NBA champions. If you’ve watched championships before, you know the championship hats and shirts are brought out immediately after the game ends. That means that both teams had to have hats and shirts ready, in case they won. Think about the planning that goes into this. Keep in mind, someone has to also be responsible to make sure the losing team, never sees the hats and shirts that were meant for them. Every scenario has a plan. Aside from the hats and shirts being brought out, the winning teams locker room has plastic hung up so that the champagne spray doesn’t ruin anything. Sports Illustrated usually runs a commercial immediately offering a special package featuring the winning team. That means they have to film 2 commercials just in case. There are plenty of cases where being prepared for either team to win, is essential to having things run smoothly. In order to do this, someone has to be thinking ahead and preparing for each scenario. Although the costs are double to have hats and shirts ready for each team, it is the only way to ensure that they are prepared. The cost isn’t an issue when flawless execution is needed. In business, we should have the same desire for flawless execution. Even if it means preparing for 2 different scenarios. By being ready for anything, we can ensure that we are prepared for whatever the outcome is. When you have systems, processes and checklists in place, you can guarantee things run a lot smoother. If this, than that, checklists can be amazingly helpful. For instance, if the Heat win: Box A with the Heat championship hats and shirts get rolled out, while box B is immediately sealed and shipped to a country that needs some hats and shirts. Heat locker room gets prepped for lots of champagne spraying. Commercial A gets queued up to run, etc. Obviously the same tasks in reverse must also be set up if the other team wins. You can bet that all of this was worked out in advance and certain people had certain tasks to make sure it all went down properly. When there is a lot to do, the only way to make sure it all gets done is when you have a checklist to go by and a system to get it done. 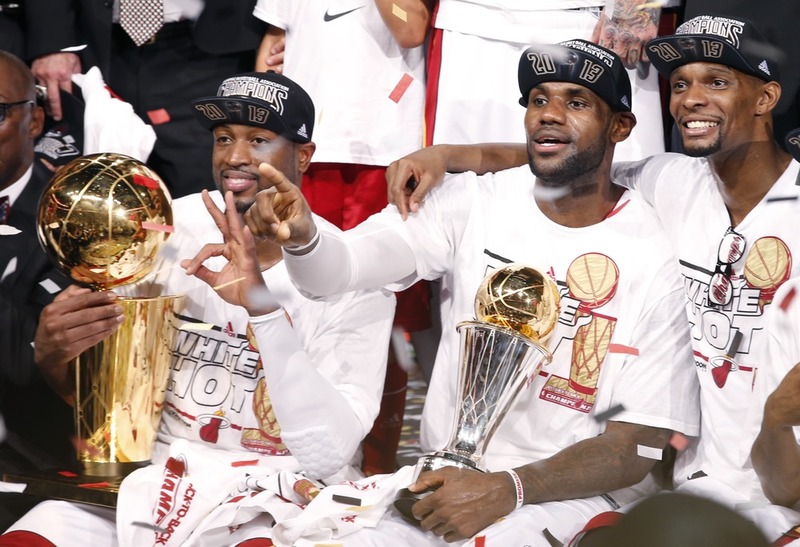 There were only 3 full days between when the Heat won, and there was a full celebration and parade going on. And only one of those days was a business day. This parade had buses with 2013 championship banners on them. Banners lined the streets. I saw fake rings being worn by workers. Police had to block off streets. A lot had to go into this. There is no way that parade happens, if someone waited until late Thursday night to plan it all. It had to be planned in advance and much of the tasks already done. Either those banners were already printed and ready to go, or a printer was standing by to start printing immediately. I suspect they were already printed and waiting. Police and the city had to already be on standby. Again, all of this has to be worked out in advance and like a machine, fired off when the time was right. In business, we should have the same mindset. Be prepared. What has to be done if A happens? What if B happens? What should be done in advance because there won’t be enough time after? Who else needs to be notified and ready in case of either event? Thinking about what goes into winning the championship and all that someone has to get done afterwards, seems overwhelming. However, breaking all that down into systems and processes, makes it run a lot smoother and ensures it gets done. Think of your business as an NBA team about to win the Finals. Are you prepared for anything? Do you have systems in place for any scenario? Does everyone know their roles and when they need to execute them? Make sure that everything has a process. Make sure you have systems in place for any event. Tasks are broken down into smaller tasks, so they are not so overwhelming. Use “triggers” to start certain tasks or task groups. For example, a customer makes a purchase, ABC happens automatically. Customers ends up not making a purchase, XYZ happens automatically. Having these systems in place will allow you to be prepared for anything. There may be times where you have to pay for things in advance, that you may not use. You may have to buy double of some things, in case something happens to the first batch. But by thinking ahead and knowing all scenarios, you can properly plan. Then it’s just a matter of making sure you have detailed the actions that must take place and assigned the appropriate people to manage it. So are you ready for the NBA Finals?